Walking backward or running backward on the treadmill works muscles in an entirely different way. Not only will you tone different muscles, but you will also work on your balance. It boosts your heart rate, making it a good interval workout variation. Walking backward should be done with hands off of the side rails once you are confident enough that you will maintain balance. Certified personal trainer Lorra Garrick says that you walk without the assistance of the handrails, your postural muscles must do more work to keep your body balanced. Your legs, hips and the muscles that control your ankles must also work more to maintain a coordinated motion. Walking backward will improve your balance, even if you must start out at 1 mph, according to Garrick. She says you can expect improvement in sports performance, step classes and other activities in which balance is challenged. If you have been using the handrails even when walking forward, try first weaning yourself from using them during any treadmill workout. Walking backward on the treadmill without using the handrails should be done at very low speed to start. It is already going to be a challenge. You can increase the speed in future sessions. 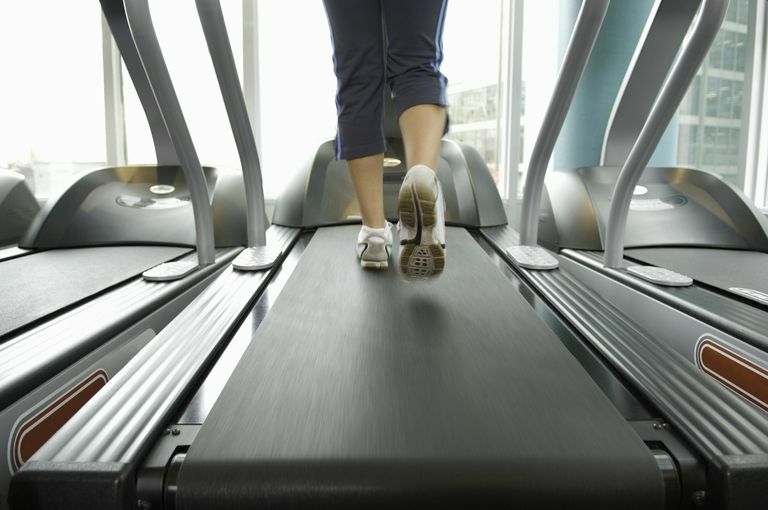 Many treadmills have a starting speed of 0.5 mph or 1 mph. Start at the lowest speed just to get into the right position and rhythm. When you feel adjusted, increase the speed in 0.5 mph increments. Settle in for at least one minute at each speed before increasing it. At faster speeds, you will clearly feel muscles working that do not get exercised during forward walking. Keep your backward intervals short when you are first giving this technique a try. It's best to only vary either time or speed. If you're going to go faster, keep your backward interval at the same duration as before. If you're going to add minutes, keep your speed the same as before. You needn’t spend a lot of time walking backward to reap benefits. Add backward intervals into your treadmill workout for a minute or two at a time. Start with trying this just once or twice during your usual treadmill workout. Depending on your agility, you may want to stop the treadmill before you turn around to walk backward and stop it again before to turn around to walk forward. Here's where it's smart to use the handrails for balance when you are repositioning yourself. Trainer Lorra Garrick offers these variations for treadmill workouts with backward walking and backward running on the treadmill. Backward walking with incline: Once you have mastered backward walking on the treadmill without holding onto the handrails, you can add incline for an additional workout. Garrick says you will feel the burn in your thighs from this variation, working the quadriceps that normally don't get much work with regular walking and running. Set the incline at 15 percent and 2 mph. You will likely notice how much more work your thighs are doing. If you are comfortable increasing the speed, you will feel even more work being done by the quadriceps at the front of your thigh. Backward-forward incline workout: Do brief intervals of one minute at 15 percent incline and 2 to 3 mph, alternating with walking forward with a lower incline (or level) for a few minutes. Aim for a 15-minute to 30-minute interval workout. Incline low walk: As you walk backward with incline, lower your center of gravity so that you’re in a one-quarter squat position. Keep your back straight and do not pitch forward. This will intensify the fire in your quadriceps muscles. Running backward can be sustained by most people at 4 mph once they get accustomed to the backward motion. You can speed up for a brief duration at faster speed once you have mastered the backward run. Try intervals of 6 to 8 mph backward jogging for as long as you can, alternating with forward walking (or slower jogging) for a few minutes, for a total of 30 minutes. Garrick says jogging and running backward upgrades athletic performance and adds spice to your routine. If you're having fun and can feel the benefits, you may start a new trend at your gym. Uthoff A, Oliver J, Cronin J, Harrison C, Winwood P. A New Direction to Athletic Performance: Understanding the Acute and Longitudinal Responses to Backward Running. Sports Medicine. January 2018. doi:10.1007/s40279-018-0877-5.